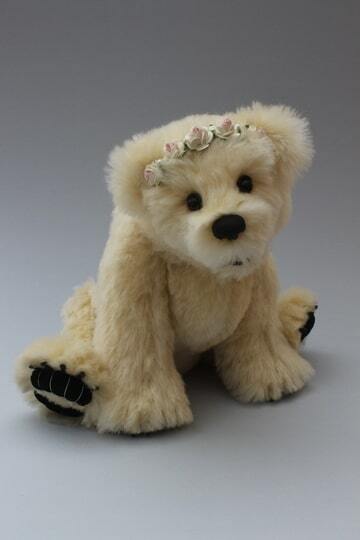 Bliss is my second Naturebear like bear that i have made. It was a long journey with Bliss but a really joy full one, i had a great time to create her. 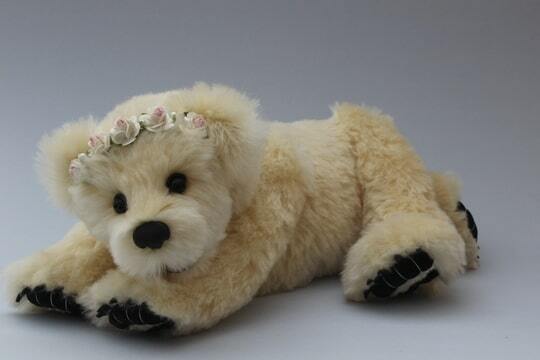 She is made of a very soft mohair in a off white/light yellow colour, her paws are made of a black suede fabric and she has black nails from fimo. Bliss has black german glass eyes and a little black nose from fimo and an open mouth. In her hair she has a tiara from light pink roses and little white pearls. Bliss is four way jointed and has a skelet in her head, body and legs, so she can be put in all sort of different directions.